Well, it’s been nearly a month since we’ve returned to Kentucky, but it feels like it’s much longer. I guess because are on the edge of being done with fixators and anxious to have it removed. It’s kind of like the last 100 miles of a road trip: those last 100 miles are grueling! Not to mention that we have the added excitement of a new baby due around the same time. But, if I had to choose a phase – the adjustment phase or this phase of just waiting for his bones to heal – it would be this phase. This is the easiest phase of the entire process. No adjustments. Showers become less of a dramatic torture chamber. And, pain has subsided to almost non-existent. Yesterday we spent all day in Nashville to follow-up with two of Drew’s doctors: cardiologist and urologist. I was pretty anxious leading up to the trip because I would be going by myself since Nathan is on the boat until next week. I was dreading the early morning (6 am) rush to get him dressed and prepped in the wee hours of the morning. I was afraid that the three-hour trip with Drew in the back seat to fend for himself would take its toll on him. I was dreading having to stop on the shoulder multiple times to appease him making us late for appointments and making my already elevated blood pressure reach critical limits. I even left 30 minutes earlier than I typically do in anticipation that we would be delayed. But, Drew watched Ninjago episodes on the portable DVD player all the way down and was very well-behaved. I didn’t have to stop once and even arrived at our first appointment, cardiology, 30 minutes early. Damn! I could have gotten an extra 20 minutes of sleep! 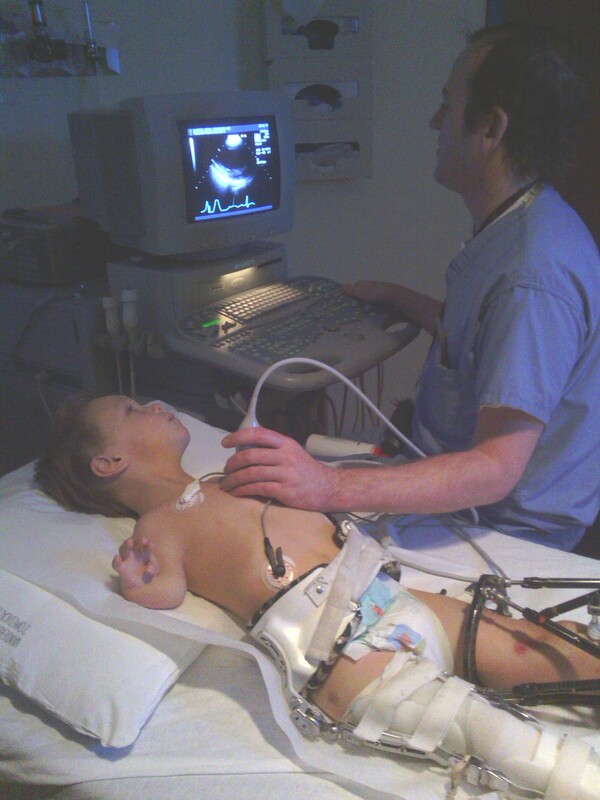 The day started off in cardiology with the usual echocardiogram, an ultrasound of Drew’s heart. I don’t know much about what to look for, but I grew a little concerned listening to Drew’s heartbeat. Instead of the rhythmic bu-bump! bu-bump! bu-bump! I heard bu-bu-bump! bump! bu-bump! bu-bump-bu! bu-bump! Echos typically take about 15 minutes. 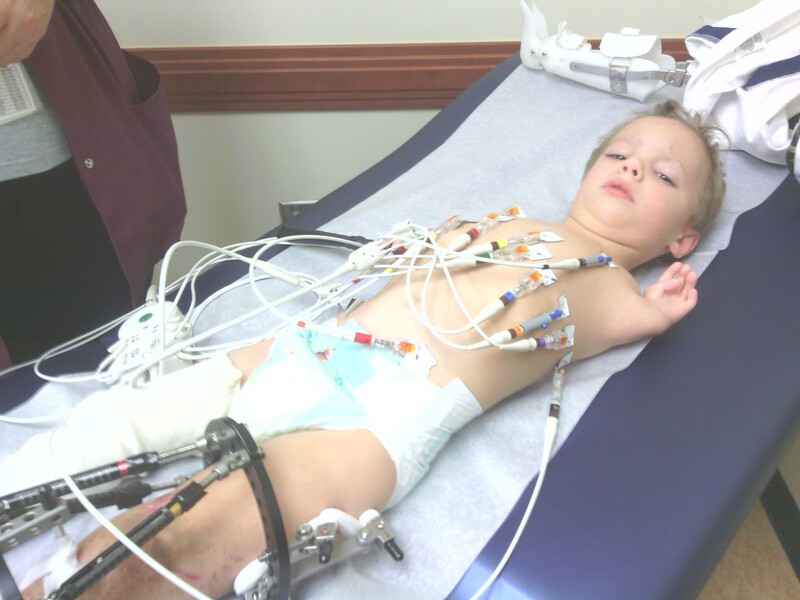 Then, we were off to vital signs and an EKG. They did the vital signs first, even collecting his weight which, of course, was dramatically inaccurate with the heavy contraption. They always do blood pressure on his leg as his right arm, though has some length, never seems to work out. On the first pressure reading, the nurse raised her eyebrow and said, “Well, THAT can’t be right!? !” So, she tested again with a very close result. Still not convinced that the reading was correct, I suggested to try the arm as 1 out of 10 times, a nurse has gotten a reading. So, with that we tried the arm only to get the same reason. The diastolic (the bottom number) was 23-27 each time…extremely low. But, since it was consistent, it appeared to be pretty accurate. Luckily, the office wasn’t backed up so Dr. Fish was able to visit us pretty quickly. He reviewed the echo and we discussed pretty much the same details from previous appointments: the leaking in his aortic valve has worsened and a few other factors, including an irregular heartbeat, are starting to be noticed meaning that surgery will be necessary to repair. Unless the situation gets critical, as clinically, he’s stable right now, they’ll want to wait until the fixator is removed and the surgeon will most definitely want any pin sites and wounds to be fully healed. He is going to discuss Drew’s heart condition during conference, again, either this week or next week but we are almost certainly looking at another heart surgery when we return to Kentucky. And, despite my mother-in-law’s hopes, a through-the-side-catheter type of operation is most likely not feasible as those “are not done at this end of the age scale” so it will be another open heart surgery through the rib cage to transplant a tissue valve “which should last him through childhood.” This, of course, means that this won’t be Drew’s last heart surgery. Urologist was good. I’ll try to spare Drew the embarrassment in 10 years so I won’t share any private details other than all concerns have been dropped. But, he does want to see us in two years just to check again. Then, we were off to home and I have to say that Drew was a perfect angel the entire time, even during a two-hour downtime between the two appointments never acting out or causing a problem. Not that he’s ever acted so terribly that he’s embarrassed me in public, but I did expect a lot more whining and a lot more stern warnings from me making the two-hours drag by. Maybe it was the gummy bears I got him at the coffee shop! In other news, therapy is going well and I am seeing improvements every day. It appears that he’s regaining the progress he made prior to the femur fracture faster than it originally came. Even though we don’t have as an effective solution to get him walking, we do our best to get him to stand and bear weight. It started out rough, as expected, but today he actually stood up for almost four minutes, only starting to grunt and complain the last 15 seconds. His typical routine is to stand up for 2.5 minutes, but even at 2.5 minutes Drew was as happy and relaxed as ever so we decided to see how far Drew would go. Drew even supported himself with one arm on a bar with a therapist close by for a few seconds today. The exercises he’s doing is helping his quads, hamstrings and hip flexors stretch so he’s standing taller and straighter everyday, instead of hunched over. I’m so proud of him and the work he’s doing. And, I’m so relieved to see such tremendous progress so fast! I just got done ordering a gait trainer for Drew to help support him and teach him how to stand and walk on his own so I look forward to that coming in the mail soon! One last note: we have officially started planning for the Walking the Walk for Drew 5K Walk/Run event. I am really excited about this event as doing a walk/run for Drew is very symbolic and prophetic of the entire reason we started doing Drew Walking Tall fundraising events! Even though we raised a TON of money with other events, our funds are running low and recently found out that our insurance and even Medicaid won’t cover the very high expenses of Drew’s therapy that he’ll be completing for months to come. It’s tentative date is May 19th at the Sturgis Airport. There are still a lot of details to be worked out, but if you would like to participate in the event as a runner, please email me at janelinky@gmail.com. We will soon have registration forms and information available. Also, if you are the owner of a business who would like to help sponsor this event, please email me as well so we can discuss how we can work together to help support Drew. I will post details and instructions on the Drew Walking Tall Facebook page as well as this blog. And, hopefully next week you’ll see us in the Advocate! So, keep an eye out and your running shoes within reach!